The Rogue River boasts an abundant variety of wildlife. Given its rugged terrain and lush vegetation it is a natural habitat for many animals that have thrived in this river corridor for millions of years, undisturbed by urban development or large human populations. Since 1968, the lower Rogue has been protected by the Federal Government's Wild and Scenic Rivers Act. Today visitors to the Rogue River are often lured by the opportunity to see black bears, bald eagles, salmon and river otters. Other animals that are often seen on the Rogue include Osprey, deer, geese, vultures, Great Blue Herons as well as a wide variety of ducks. Less common sightings include rattlesnakes, beavers, mink, newts, gray foxes, and mountain lions. 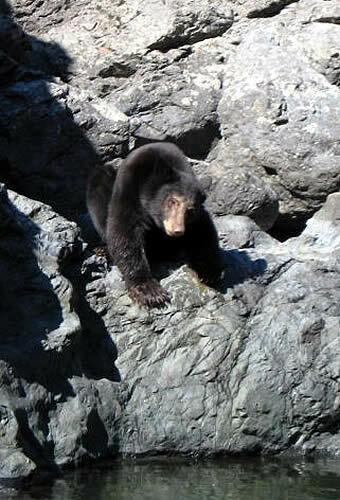 The black bear is the smallest of the three bears species found in North America. Their current range is restricted to relatively undisturbed forested regions, like the Rogue River. Though they generally have shaggy black hair, the coat can vary in color from chocolate-brown to cinnamon to blond. Oregon is home to about 25,000 to 30,000, (the most of any state in the lower forty-eight) with most of these bears inhabiting southern Oregon. They have an excellent sense of smell but poor eyesight. The black bear is an omnivore and will eat herbs, nuts, berries, salmon, crayfish and trout and will seek out food within orchards, beehives and agricultural croplands. They may scavenge garbage dumps or trash bins of businesses, homes or campsites. They seldom attack humans unless cornered, threatened, or wounded. They are less likely to attack humans than grizzly bears and typically flee for cover as soon as they identify a human visitor. They can live 20-25 years in the wild, but average around 10. There are two types of salmon that spawn in the Rogue River, the Chinook (or King) and the Coho. An easy way to tell the difference between Coho and Chinook is that the Coho develop hooked jaws and teeth and have a pronounced red color to them. A spectacular sight on the Rogue is to see the salmon congregating at the mouths of side streams and creeks to take advantage of the cool water coming in. There are two runs each year, one in the spring and one the fall. The salmon travel up to 150 miles upstream to reach their spawning grounds and can be seen trying to jump up Raine Falls during the fall run in late August. Once the salmon enter the river to spawn they no longer feed, but are very aggressive and strike at objects, which is how they are caught by anglers. In the fall of 2002 a world fly-fishing record was broken when a 71.5 lb. Chinook Salmon was caught at the mouth of the Rogue in Gold Beach by Grant Martinsen.